For the past three years, that lyric meant Manhattan, as Lin-Manuel Miranda’s “Hamilton” turned Broadway upside-down. Here in the nation’s capital, fans memorized the entire soundtrack from afar, but not everyone could afford top dollar to see it on Broadway. 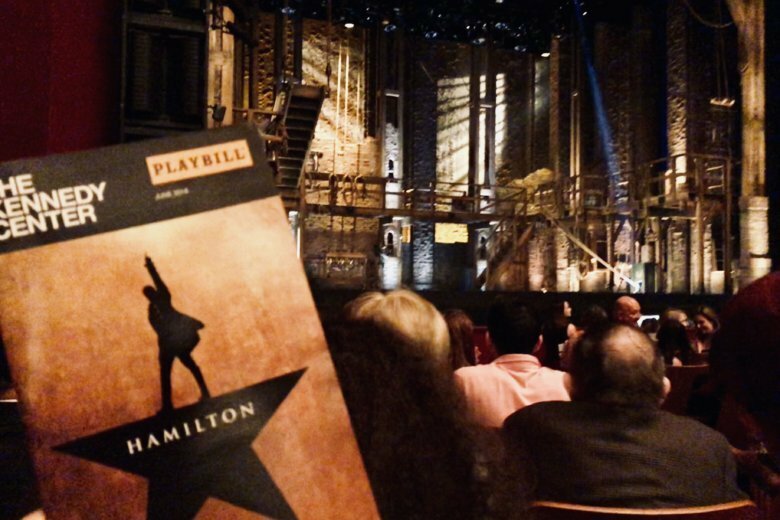 This past week, D.C. finally got a glimpse of “Hamilton” as it kicked off a three-month run at the Kennedy Center (June 12-Sept. 16), and not only does it live up to the hype, it exceeds it. Based on Ron Chernow’s 2005 biography, the musical holds up Alexander Hamilton as the most underrated Founding Father. He fights in the American Revolution, pens the Federalist Papers to gain public support for the U.S. Constitution and serves as the nation’s first treasury secretary, before tragically losing his life in an infamous duel with political rival Aaron Burr. The historic account caused Miranda’s creative wheels to spin with dramatic potential. Miranda tested that song in a White House poetry jam, which quickly became a viral video. Before long, “Hamilton” was the hottest ticket on Broadway, selling for over a thousand bucks. “You don’t mess with people on their ‘Hamilton’ tickets,” star Leslie Odom Jr. joked with WTOP. Likewise, D.C. folks flooded the Kennedy Center website in March trying to land tickets. Those who made it through will experience a one-of-a-kind songbook of rap, jazz and show tunes. The catchiest songs come from the Schuyler Sisters, including Hamilton’s eventual wife Eliza (Julia K. Harriman) and secret pen-pal Angelica (Sabrina Sloan). Together, these ladies deliver a pair of R&B gems, first with “The Schuyler Sisters,” a feminist call with “work” to be done (“You want a revolution? I want a revelation, so listen to my declaration”), followed by the swooning romantic joy of young love in “Helpless” (“Down for the count and I’m drowning in him”). Hip-hop fans will pick up references to famous emcees, from Grandmaster Flash’s “The Message” (“It makes me wonder how I keep from going under”) to Notorious B.I.G.’s “Juicy” (“And if you don’t know, now you know”). Seeing as so much of the show is rapped, it might help to familiarize yourself with the soundtrack before you walk into the Kennedy Center. It’s important to pinch yourself throughout the show, taking note of all the people of color in the cast, doing what “Black Panther” did for Hollywood a full three years earlier on Broadway. There’s a chance you’ll get so sucked into the story that you’ll forget all about it. Even better, younger viewers might not even notice at all, which is when we’ll know we’re making progress. The diverse cast isn’t the only striking visual. Precision spotlights and a rotating stage create dynamic choreography, particularly in the climatic duel between Hamilton and Burr where time stops and the characters rotate as the bullet travels in slow motion across the stage. In this case, Miranda just told Hamilton’s story to perfection, ensuring that the “10-dollar Founding Father” will live on forever, making history come alive for a new generation.